As part of Millikin University’s 100th Homecoming, students gathered to hear from alumni on their career paths, journeys, and lessons learned in the technology world. A huge thanks goes out to Tony Giannino ’00 and Ed Raffenetti ’02 for sharing their stories. 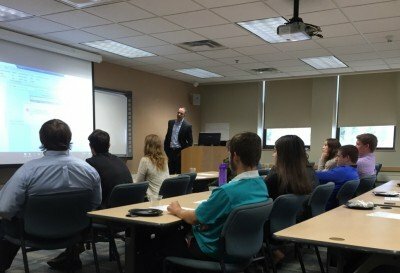 In addition, thanks to Kameron Wilkins and Taylor Sanders ’16 for sharing their new MU Performance Consulting student-run venture vision and to Taylor Wilson ’16 for sharing her internship and out-of-class opportunities. This was a great opportunity to build mentoring relationships with alumni and for younger I.S. majors to connect and learn from those about to graduate.